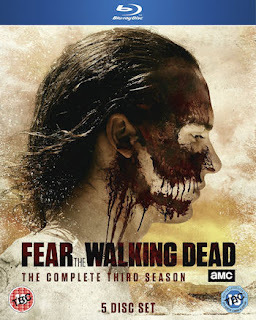 From AMC Studios, FEAR THE WALKING DEAD: THE COMPLETE THIRD SERIES returns with the walker apocalypse reaching new heights as borders and civilisations are broken away and a new world order formed. The survivors will be brought together in the vibrant and violent region formerly known as the U.S. - Mexico border. As international lines are done away following the world’s end, our characters must attempt to rebuild not only society, but family as well. Madison has reconnected with Travis, her apocalyptic partner, but Alicia has been fractured by her murder of Andres. Madison's son is only a few miles from his mother, but Nick’s first action as a leader saw him and Luciana ambushed by an American militia group – the couple escaped death, Luciana was shot, and Nick no longer feels immortal. Recovering both emotionally and physically, Strand has his sights set on harnessing the new world’s currency, and Ofelia's captivity will test her ability to survive and see if she can muster the savagery of her father. 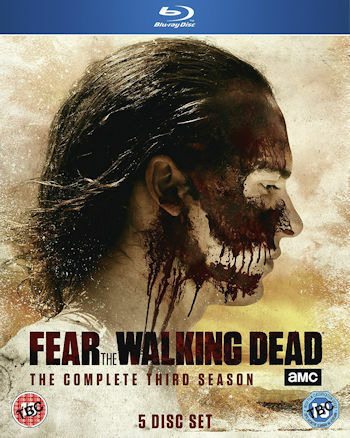 FEAR THE WALKING DEAD: THE COMPLETE THIRD SERIES arrives on Blu-ray and DVD from 4th December 2017, courtesy of Entertainment One and will be available to pre-order shortly.